Scuba diving allows humans to go beneath the surface of the deep blue sea in order to understand a whole new world that lives within the ocean. People can get up close with exotic fish, coral, and other undersea fauna that they might otherwise only see in pictures. But if they’re really lucky, they might even have some close encounters with some of the sea’s most majestic creatures! Such was the case for one experienced diver and his friend who captured everything on camera. 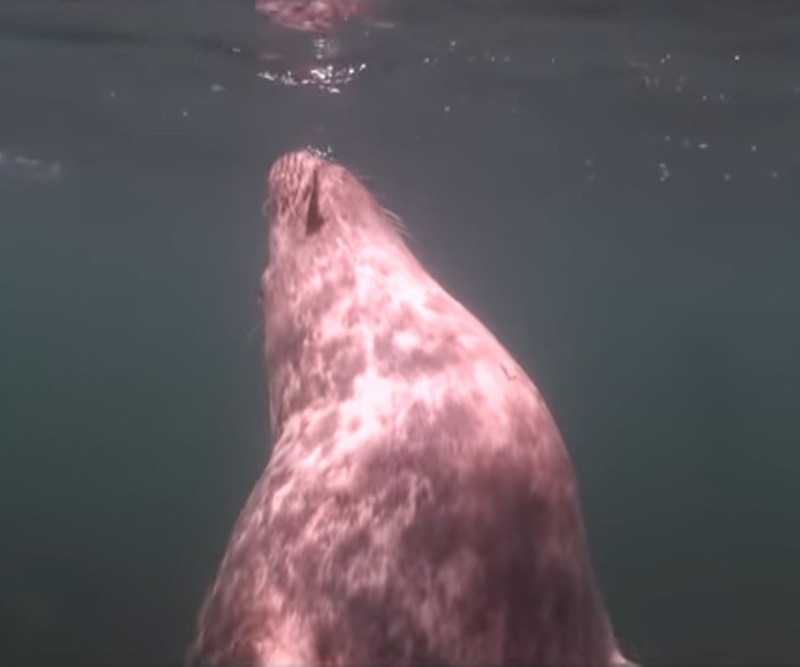 When some seals suddenly approached them, it was clear that these animals wanted to tell them something. But the fact that these seals came forward in the first place was a cause for concern, as you’re about to see. 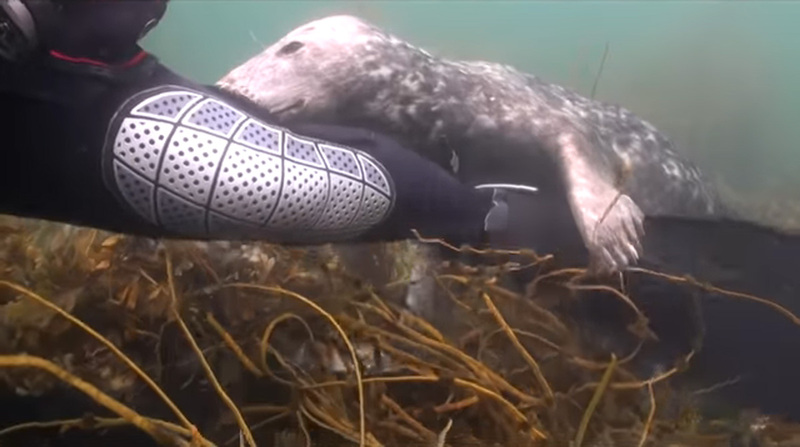 Two unsuspecting scuba divers were in for the experience of a lifetime when they entered the chilly waters at the Isles of Scilly. Located off the coast of Cornwall, this archipelago’s economy relies heavily on its production of cut flowers, mainly daffodils. 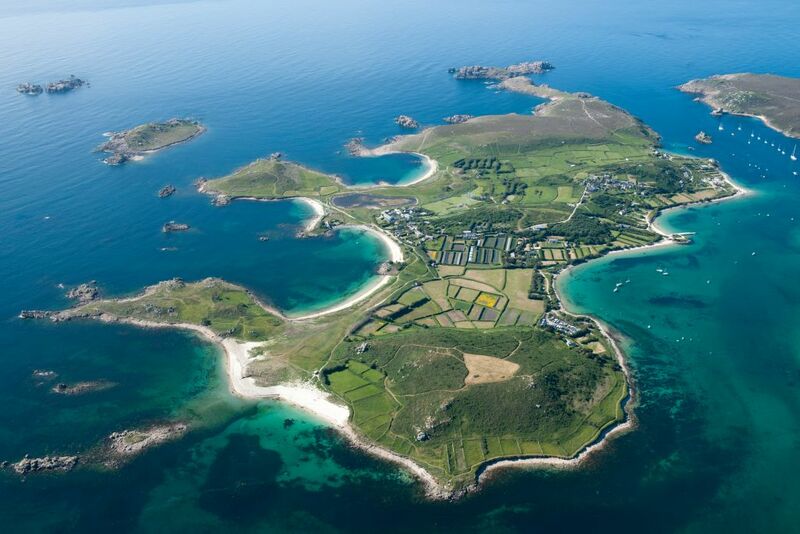 But the Isles of Scilly are a popular tourist destination in the U.K. and people go there to see much more than flowers. These scuba divers knew to look beneath the surface. 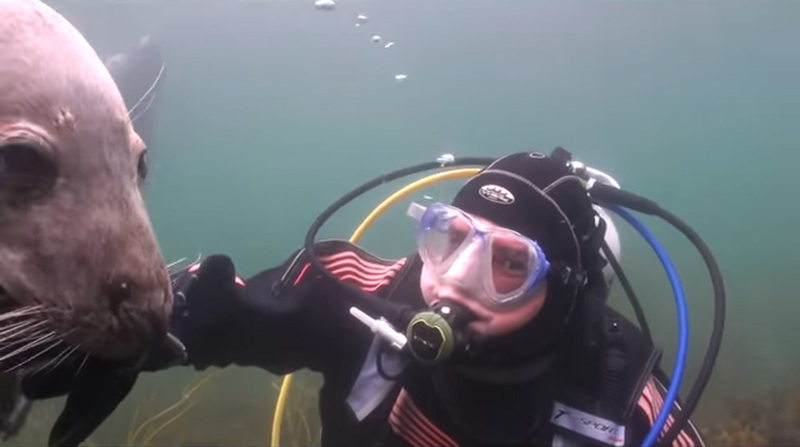 Gary Grayson of Worsley, England is an avid scuba diver. He and a buddy decided to see what the Isles of Scilly had in store for them that day. 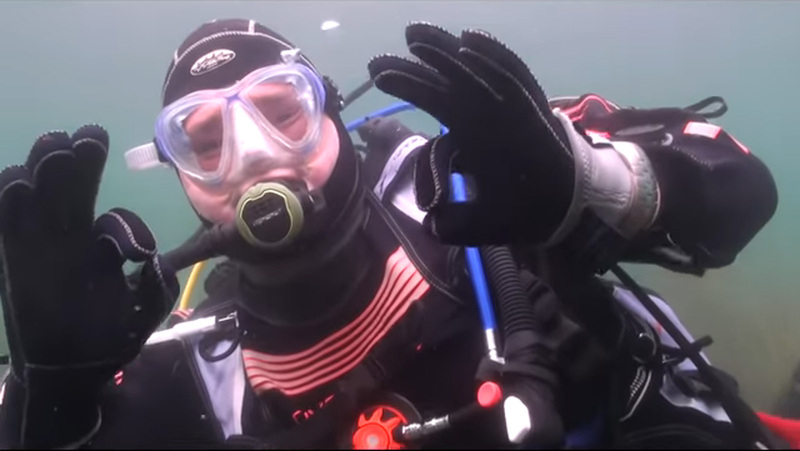 The waters of these isles are often listed as one of the top places to go diving in the U.K.
One never knows what they might encounter below the surface. The Isles of Scilly are infamous for shipwrecks the tricky shorelines have caused throughout centuries, adding onto the list of what divers can explore. When Grayson and his diving partner went beneath the water that day, it wasn’t ancient wreckage that caught their eye. Indeed, there were unique flora and fauna to examine, but that wasn’t what stopped them in their tracks. 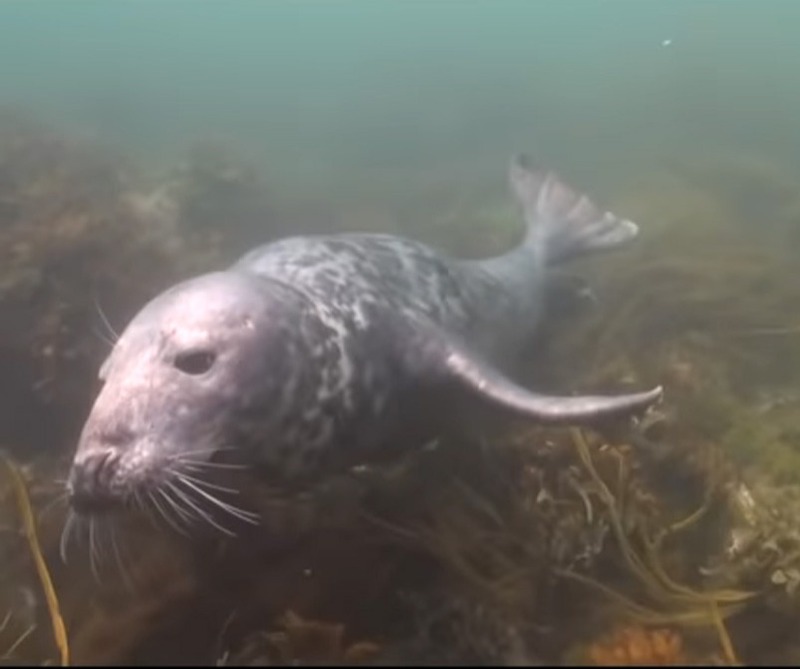 Grayson and his buddy were taken by surprise when two Atlantic grey seals appeared out of nowhere. 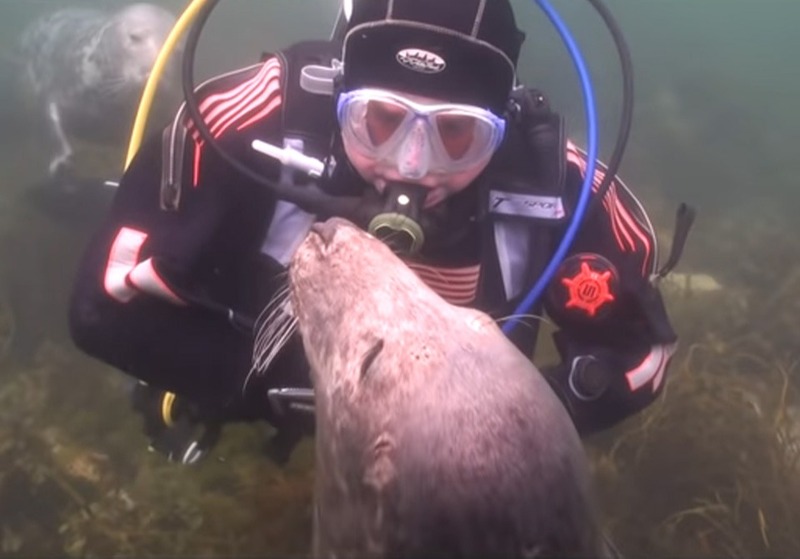 Some people might freak out at the sight since seals aren’t always as friendly and docile as we make them out to be. Divers are taught not to disturb animals in their natural habitat, especially since the results could be more disastrous for the diver rather than the animal. When Grayson and his diving partner noticed the approaching seals, they did their best to remain completely calm. 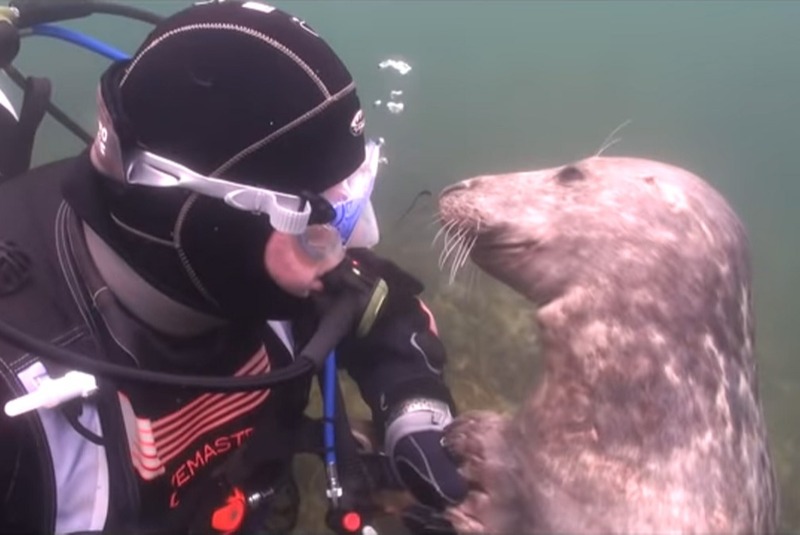 Most seals have a reputation among divers for being curious and playful, but some have been known to get aggressive with humans that seem threatening. Grayson tried not to appear as a threat. While Grayson and his buddy remained calm, the two seals began approaching them. They remained as still as they could but knew this would be a great experience to capture on film, so they took out their camera. 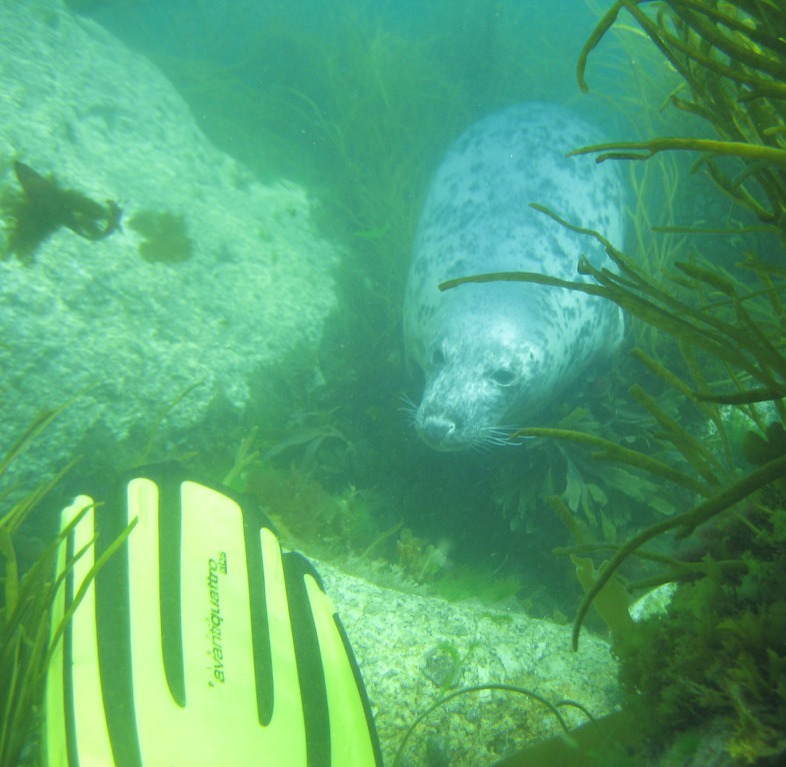 Seals are known for swooping in from behind or appearing in the middle of thick kelp forests, just like the one these divers were near. The divers kept the camera rolling to see what might happen next. Nature is inherently unpredictable, especially when it comes to the ocean – the largest natural ecosystem in the world. There’s still a vast amount of the deep blue that humans have yet to discover, so divers really never know what they’re going to get every time they go into the ocean. Gary Grayson is known for his diving videography but this time he was the one who got to have the experience of a lifetime. 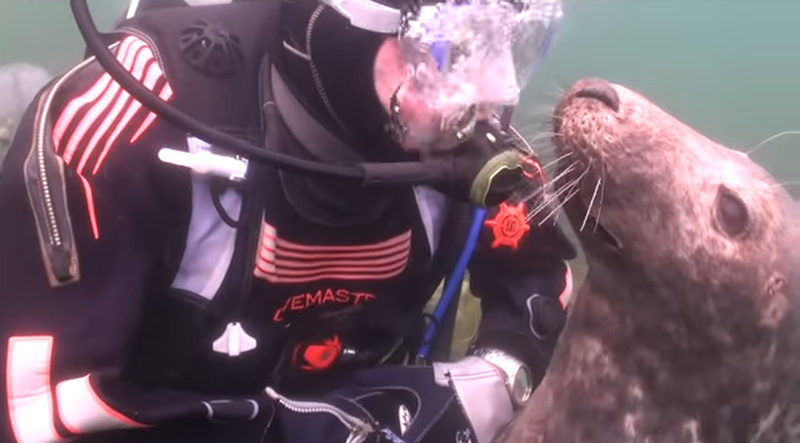 He certainly didn’t expect the seals to do what they did over the next few minutes! Luckily, Grayson dove with a friend who was there to capture the entire encounter for him. Little did they know at the time, they would be filming incredible footage that millions of people around the world would nearly lose their minds over once it went viral on YouTube. 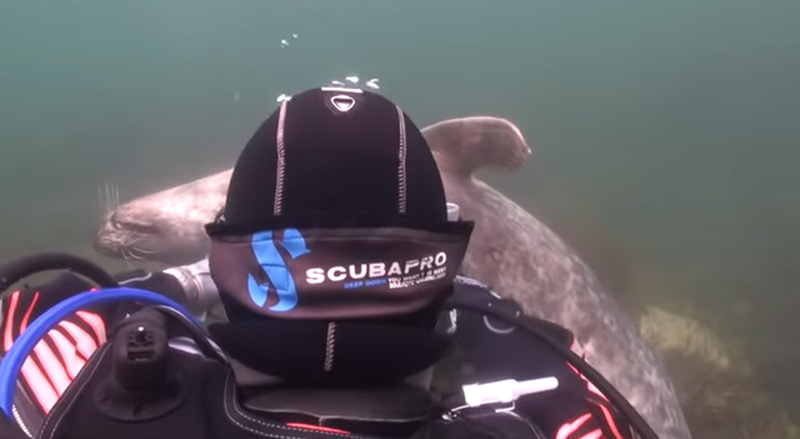 Miraculously, the seals swam closer and closer to the divers as they continued to film. 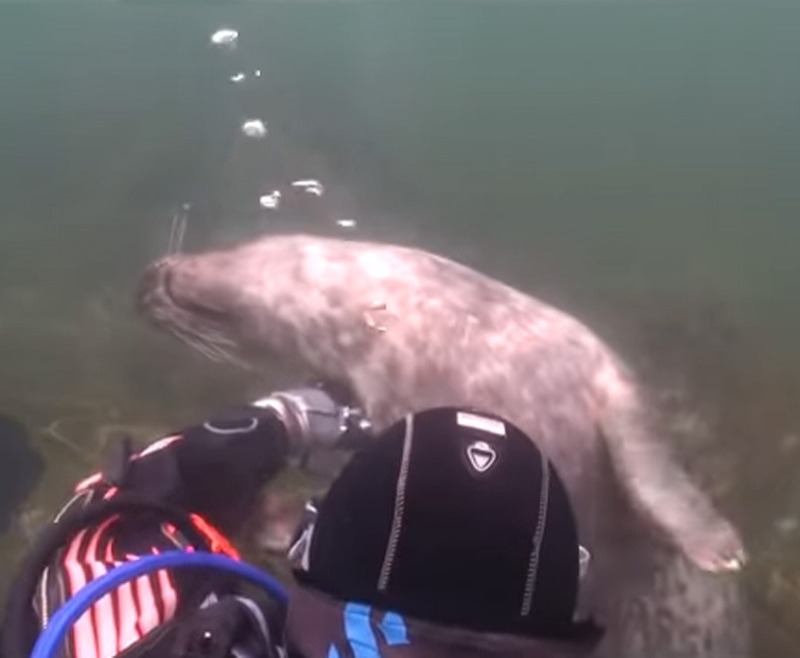 So close, in fact, that the infamous video begins with a seal right next to the camera. These adorable seals continued to approach and it didn’t take long for the divers to realize that these guys were mere pups. Once they recognized this, Grayson and his friend knew how important being still was in that moment. They wanted the baby seals to feel safe and comfortable enough to stay lingering. Because they were young, the pups were likely more skittish and the odds of them swimming away were higher. The divers didn’t want to miss out on an incredible opportunity to capture these wild animals up close. Luckily, it wasn’t long before the seal pups warmed up to Grayson and his friend. The seals began encircling the divers, almost as if they were putting on a show. Seals have an inquisitive and playful reputation. But what makes these particular pinnipeds especially peculiar is the fact that they each have their own personality. It wasn’t long before one the seals took action, as you’ll soon see. Most seals are generally curious and friendly creatures, otherwise, some are standoffish and skittish. Knowing this, the divers had to be cautious about what they were dealing with to protect their safety since it could’ve gone either way. Even though they had plenty of experience under their belts, the divers were still apprehensive about the outcome of the encounter. Getting this up-close-and-personal with a wild sea creature wasn’t something they’d experienced previously. The seal pups soon revealed themselves to be curious types. The more they encircled and closed in on the divers, the friendlier they seemed to become. 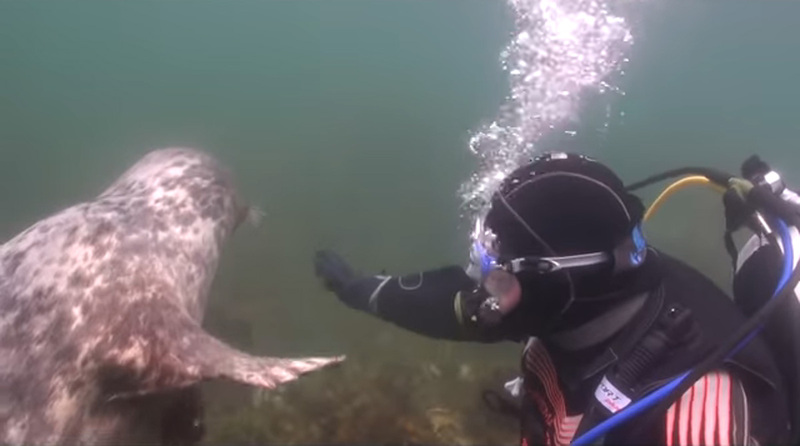 The divers were likely relieved and excited to know it was turning out to be a positive encounter. These seals were just like rotund water dogs. They even have adorable puppy-like eyes that lure you in to play. The divers couldn’t have predicted what would happen next. Grayson and his diving partner could hardly believe what was happening to them. The seals were in such close proximity, that they were fully immersed in the moment. Seals don’t typically open up so fast, as they too practice an immense amount of caution to protect their own safety. 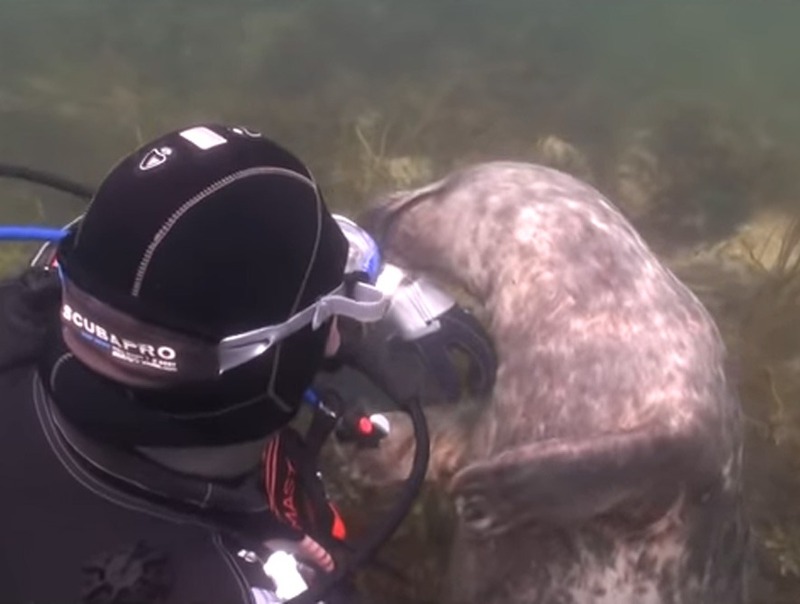 But to the divers’ shock, the seals swam right up to them as if they wanted to become friends! It was a rare moment that everyone around the world got to witness. 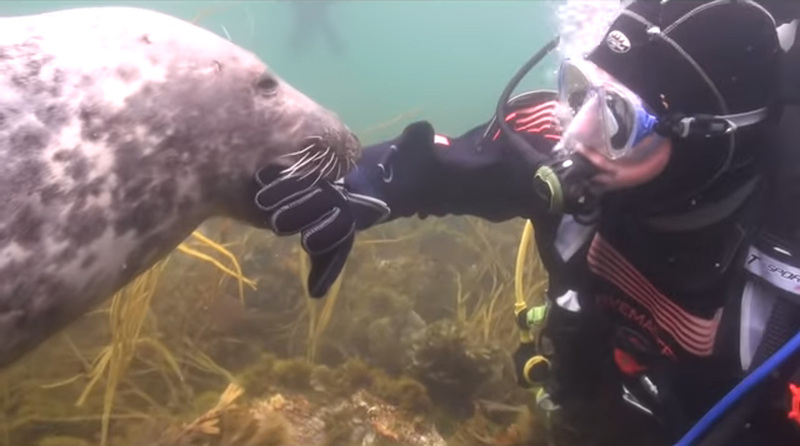 Grayson did at least shake the seal’s flippers as they met face-to-face. After Grayson “shook hands” with his new underwater friend, the seal held onto his arm with its flippers. 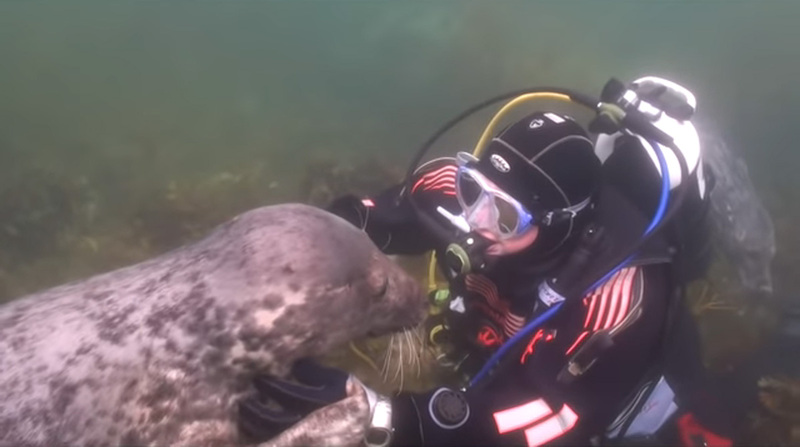 Because they had never had such a close encounter like this before, Grayson and his buddy just let the seals take the lead. They were unsure of exactly how to approach the situation since most scuba divers aren’t avid animal trainers. Instead, Grayson continued to float still while the seal continued to rub its head and neck into his arm. 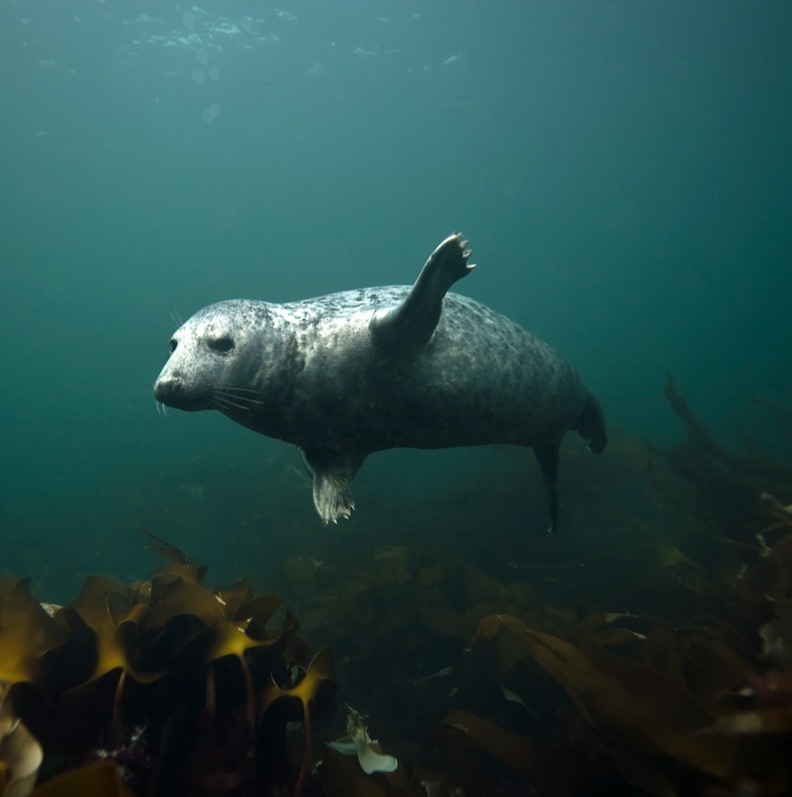 Usually, when divers go out to sea with the intention of examining wildlife, they must swim for days with a pod of seals in order to gain the animals’ trust. Within that amount of time, the seals must determine if the humans pursuing them are safe to approach. This is why Grayson and his diving partner didn’t make any sudden movements when they saw the seals. It was odd in the first place that they were being approached so soon. 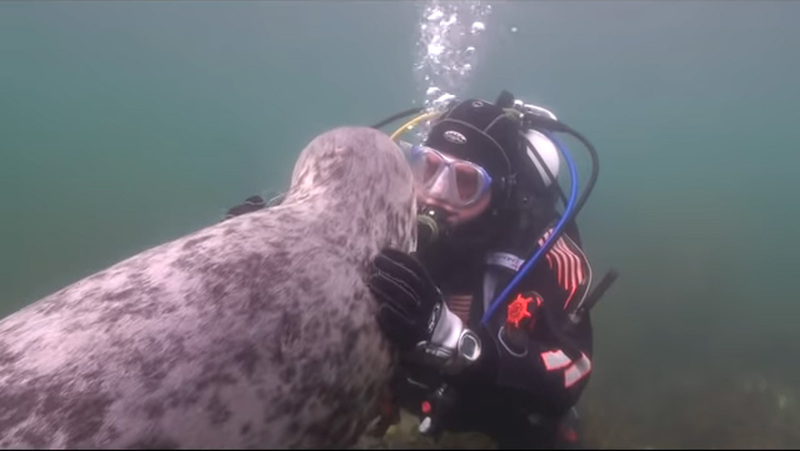 A seal getting that close to a human so suddenly is usually seen as a sign of aggression. Thankfully, Grayson and his buddy handled it so well that the seals ended up wanting to play! After nuzzling Grayson’s arm, the seal began play-fighting by nibbling at his suit. Meanwhile, the other seal was comfortable enough around the humans to swim around them and mind its business. Perhaps it was looking out for its friend like Grayson’s was for him. These seals swam gracefully in the water, which only added to the illusion that they were content in the presence of these humans. Usually on land, they have to waddle around on their flippers and hop onto rocks or boats. But it’s underwater where they’re truly in their element. After seal pups are born, they spend at least four months with their mother before venturing off. Perhaps these seals had finally left the nest and we’re exploring their new world. This playful seal pup obviously went against what was expected and swarm right up to Grayson. The creature immediately started sizing the diver up but once it realized Grayson was friendly, it didn’t hesitate to see how far things would go. There were clearly no boundaries for this seal. 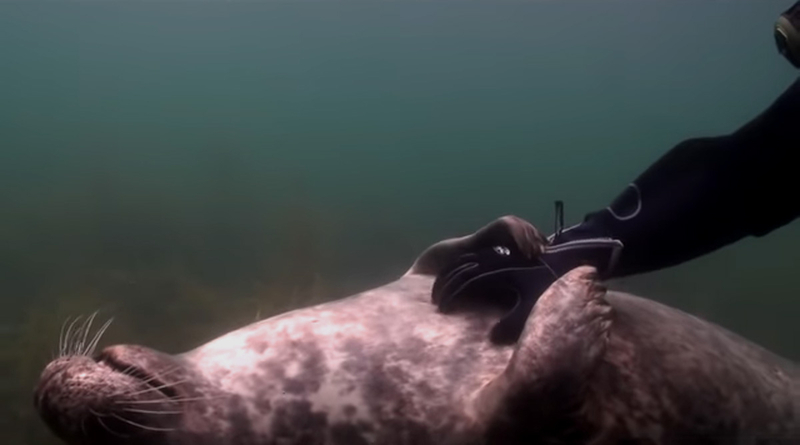 After the seal nibbled a little more at Grayson’s suit and kept nuzzling its head against his hand, it ended up making a move no one saw coming! Grayson realized that the seal must have liked the feeling of being nuzzled. That’s when he started scratching the seal’s neck and head, just as if he was an actual canine puppy. The seal let Grayson continue to do this for a while. For their part, Grayson and his diving partner couldn’t believe their luck! It was certainly a diving trip that they would never forget. But what really made it unforgettable was what the seal decided to do next. After the hand-to-flipper shake and the nuzzle session, the divers were unsure about how much time they had left with these majestic sea creatures. Moments like these were especially fleeting, so it was great that they were able to capture everything on film. At any second, the seals could’ve decided to swim away but after everything that had already happened, things were apparently just getting started. The seal started making movements he wanted Grayson to interpret. As Grayson continued to scratch its neck, the seal kept inching closer and closer to the sea floor as if it was trying to tell him something. It continued to nibble at Grayson’s glove in an effort to get him to do what it wanted, but it was up to Grayson to figure out exactly what that was. This went on for a few minutes until finally, the seal made everything clear. Eventually, the seal turned over on its back. At that point, it was obvious what the seal wanted Grayson to do. Apparently, Grayson’s petting skills were so excellent that this seal wanted him to rub his belly! It was amazing that this seal was exhibiting such qualities! This would be normal behavior for your average dog or cat, but the fact that a seal likes belly rubs too only goes to show how universal the feeling is among animals. 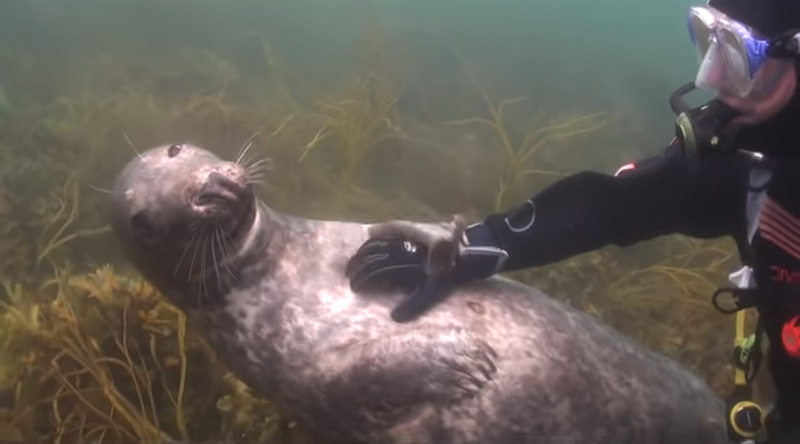 Grayson’s belly-rubbing skills were so good, that you can see the seal flapping his flipper over the diver’s hand in approval. It was a darling sight to see, especially since the seal’s flabby coat moved along with the waves. The seal remained on its back for some time, clearly enjoying the feeling. If anything, it only made the seal more playful as he snapped back up to make another move! After the seal decided it was done with its belly rubs, he swam back up to face Grayson. Grayson’s hand moved underneath the seal’s chin and began scratching. 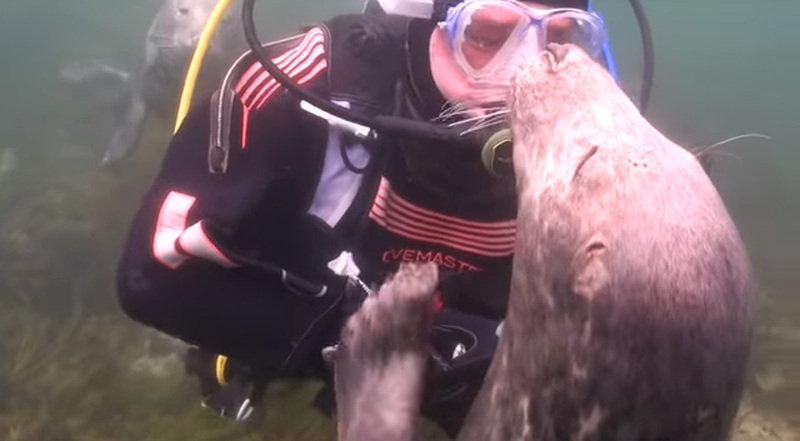 The seal apparently loved that too, as the video shows it smiling as it is happening. But soon, the seal became more lively and wanted to play some more with its new friends. At that point, it began playfully nibbling at Grayson’s glove and even had his hand in its mouth! 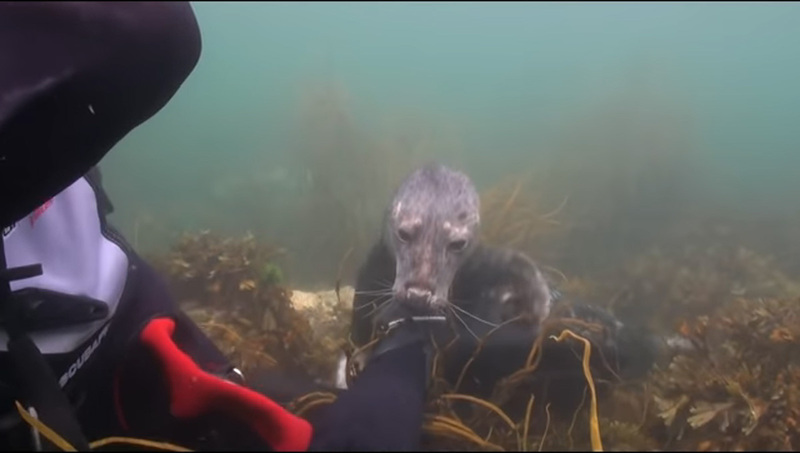 In the video, Grayson looks at his friend with a smidge of concern on his face the more the seal began biting at his hand. Luckily, the bites didn’t appear to forceful and it seemed the seal was just trying to play with him some more. Grayson then decided to let the seal do its thing. Meanwhile, the second seal thought it was his turn to get some action and started sniffing at Grayson’s feet. Eventually, the first seal grew tired of the fun and games. 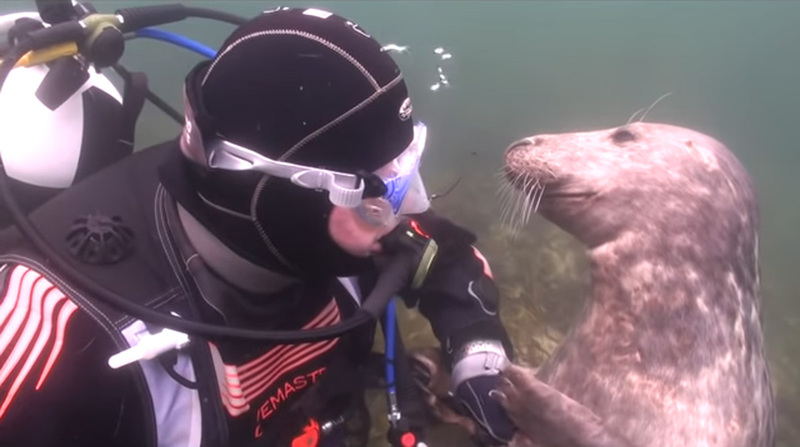 It was obviously grateful for the belly rubs but as the diver continued to pet its coat, the seal started to swim away. At that point, it’s seal companion noticed and knew it was time to go. 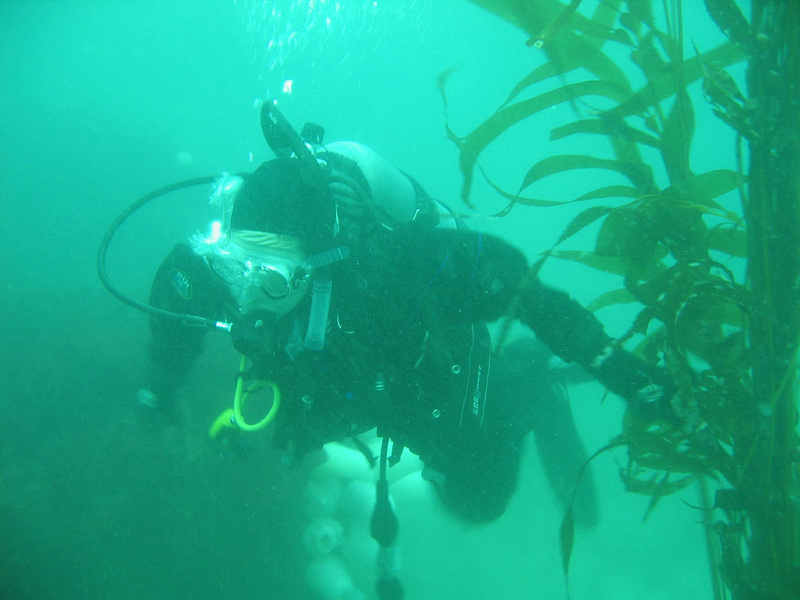 The divers watched the seals swim away but were ultimately enthusiastic about the entire experience. Of course, they couldn’t have predicted how viral the encounter would become. Grayson’s video soon gained international buzz and of course, he was asked about the experience. He told media outlets that he was “absolutely loving it” the entire time it was happening. “I had seen other seals in the water but they just buzzed past us. 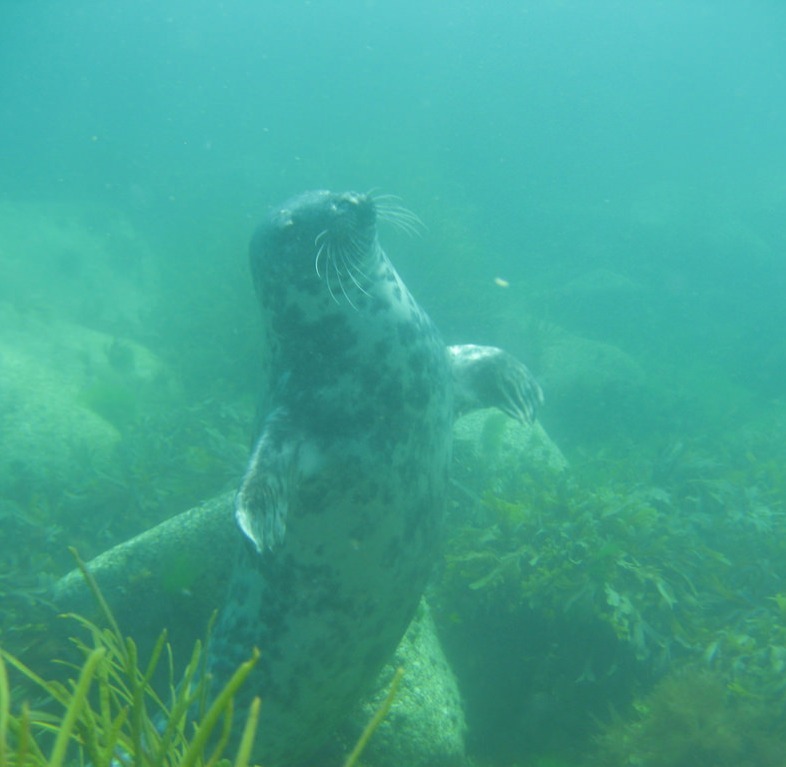 None was as inquisitive as [this seal] was, and none as friendly,” Grayson told the Manchester Evening News. The 55-year-old businessman had quite a story to tell. Most people might not know how to react in such a situation, but Grayson and his buddy handled everything exactly as they should have. 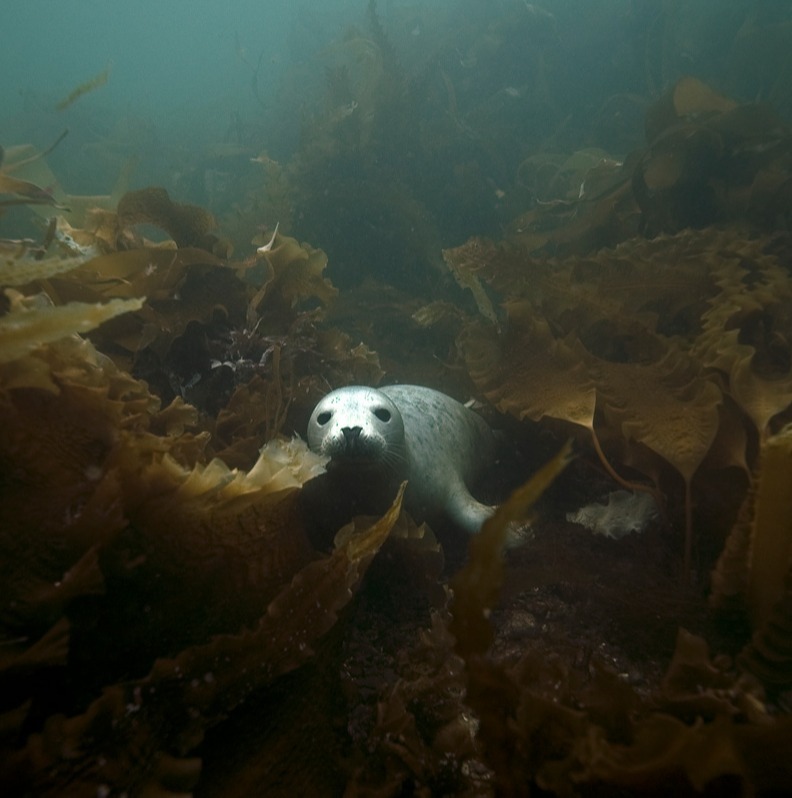 “We were told just to sit on the bottom of the kelp but the more still we were the more inquisitive this seal was because we were in their world,” Grayson said. Even though they tried not to seem threatening, their stillness apparently was a source of intrigue for the seals. 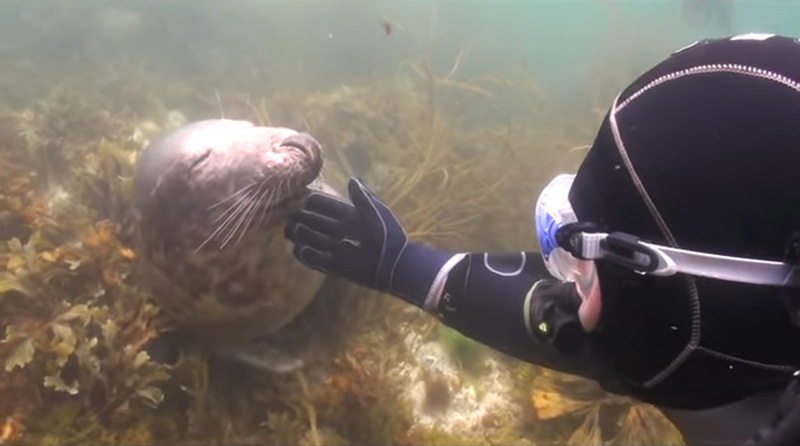 For his part, Grayson admits that as a seasoned diver, he has really never had an experience quite like what he did with the seals at the Isles of Scilly that day. 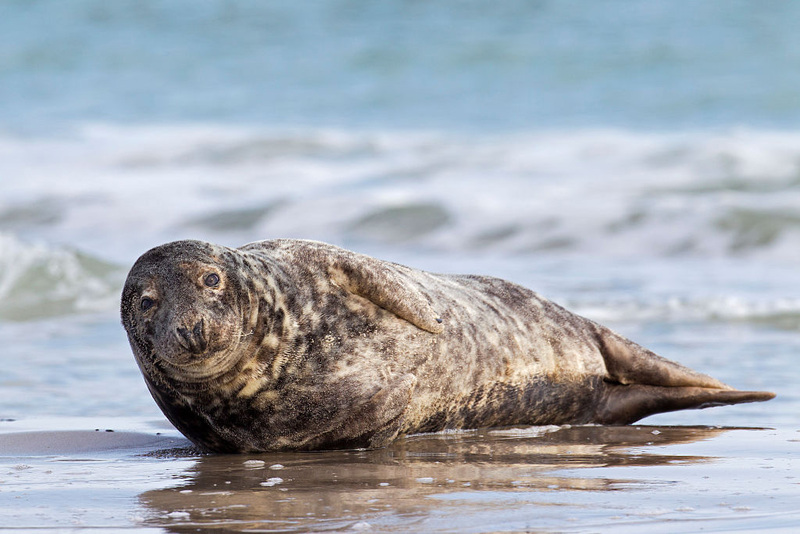 “The grey seal came across and had five minutes with me, kind of thing. Then another was climbing up my leg. I’m an experienced diver but I have never known anything like that. I’ve been all over the world, to Mexico and Cuba, to dive with great big mantras and sharks,” he added. 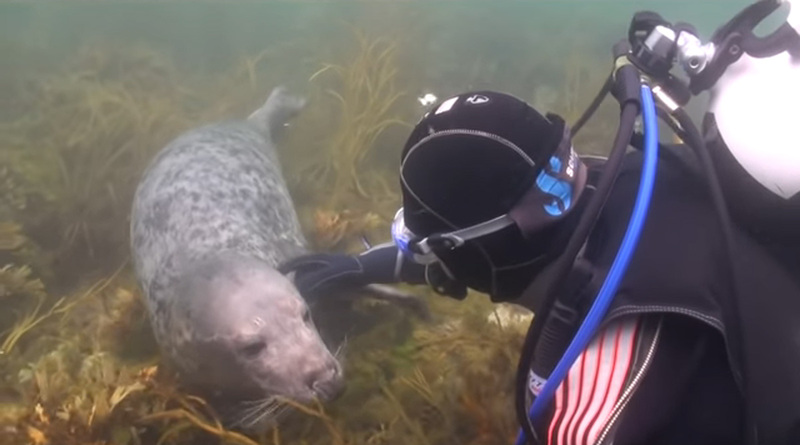 Grayson and his diving partner may have been a bit startled at first, but that’s likely because they weren’t expecting the seals to interact with them. “I’m not one to frighten easy,” Grayson told M.E.N.